This Storybook new 1600 Sq ft Cottage sits on a meticulously landscaped 2 acres overlooking the Coveside Stable. This home has all of the ammenities of home and is less than 5 minutes to the village of Chester.The Large Master suite has a king size bed and a wall mounted Flatscreen TV. It has a door leading to a private deck. It also features a large ensuite with a clawfoot tub. The second bedroom features a queen size bed. The main level has a living room, dining area and modern kitchen. There is also a den which features a wall mounted flatscreen TV, pull out bed and a Full Bathroom. This den walks out to the rear lower deck which has a barbeque and lots of space to relax. A country setting within Chester overlooking beautiful Coveside stables and close to all that Chester has to offer. Beautiful home and property. Super owners. Breathtaking, when you walk in. Great TV. Should be rated higher then 5 stars. Sandra & Bill we’re just great ,the home was beautiful and so well equipped .We would rent it again if we go back to the area .Loved it . Wonderful house with everything I needed and great hosts! The hosts were wonderful and shared their knowledge of local farmers markets and a little-known beach that was the prettiest one I’ve seen in Nova Scotia. They invited me to take veggies and herbs out of their vegetable garden. It was a thoroughly enjoyable stay and I expect I’ll be back again sometime. My wife and I were visiting Nova Scotia for the first time so were not familiar with the area. Chester is a quaint waterfront community with several good restaurants. The home was immaculate and so charming. The space was extremely functional as well. 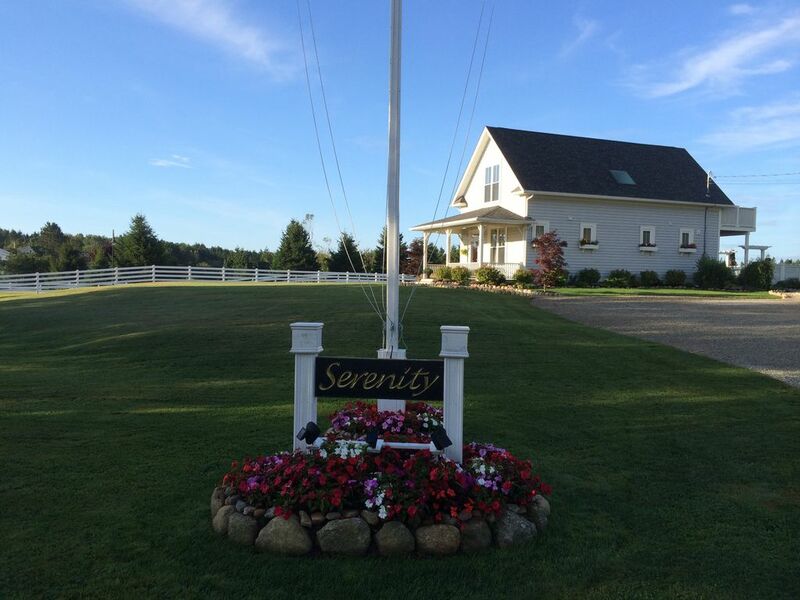 The 2+ acre lot is meticulously maintained with beautiful trees, shrubs and flowers. The master bedroom features a deck from which you can survey the surroundings. The bed was very comfortable and bathroom nicely furnished, including a soaking tub and walk-in shower. The kitchen and living spaces were both well appointed and functional. The owners stay in a "tiny home" at the back of the lot when they have guests. This provided us with total privacy but it was nice to have them nearby to ask questions about restaurants, attractions, etc. They were extremely friendly and helpful. We're confident you won't find better accommodations in Nova Scotia. Lovely home with all the amenities necessary to make stay comfortable. Although we only stayed here for a couple of nights, the house was very comfortable, clean and well equipped. Sandra was very welcoming and accommodating. Just note that if you are looking for something secluded this house is on a main road- although we could not hear cars from inside.